Last Trip South . . . I headed out on my last trip south about 10am. I say ‘last trip’, since I’m not going down on Wednesday and then we move down to Santa Fe on Thursday. So when I go back to work on Friday I’ll be making a 30 mile round-trip and not a 140 mile one. Yay! I really wish Facebook would just stop fooling around and changing things. When I first started posting our blog to FB every night, I could pick what photo I wanted to show on the front page. I couldn’t pick from all the blog’s photos, but most of them, anyway. Then months later, I could no longer pick from the photos, but had to take the one they picked for me. And the one they picked was never consistent. Sometimes it was the first one, sometimes it was the last one, or maybe one in the middle somewhere. But at least I could delete it if I didn’t want that one use. But then a couple of weeks ago they changed it again. Now I can’t delete it at all, but I’m just stuck with which ever one they pick. Bummer! Then a couple of weeks ago, the crying emoji disappeared from the the display shown when you clicked on the Like button. In its place was just a hole. Then a few days later it was back. Now the entire emoji display is gone completely. Now we can only select ‘Like’ and nothing else. STOP MESSING WITH STUFF. JUST LEAVE IT ALONE. Recently I came across this article about Amazon selling houses online. Not bad. And no, it doesn’t ship under Amazon Prime. But this got me thinking about another big company that used to sell homes online . . . well, the online of the time, the Sear’s Catalog. And they not only sold homes, but also ‘mansions’. 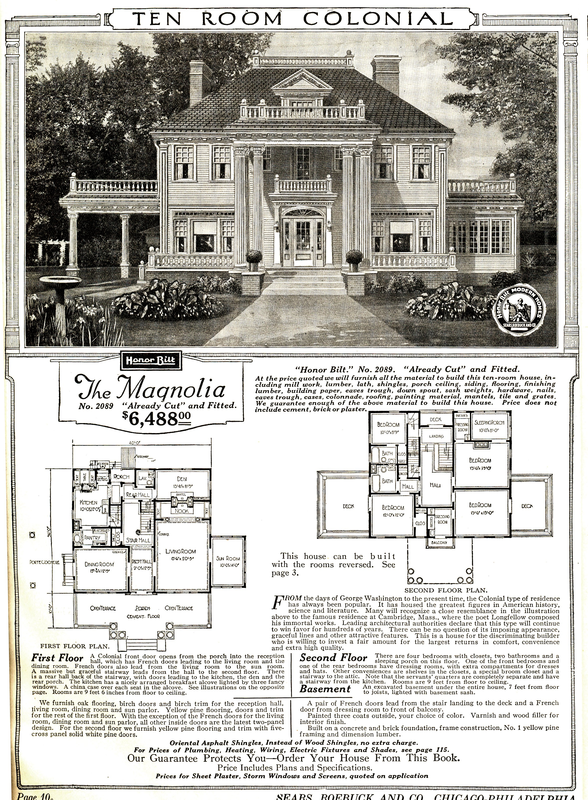 ‘The Magnolia’ seems to be the largest model sold by Sears. At ten rooms, two stories plus a basement, it was a real ‘kit’ with every piece cut and fitted. And included everything down to the nails and paint. Here’s a full size copy of the Sears ad. There are still a number of ‘Magnolias’ around the country. Here’s one in North Carolina. Still looking good. Apparently it’s now a Dolce & Gabbana store. Well the vote is in. And it’s 26 to 0 in favor of blue awnings on the rig.